In the United States, the Cinco de Mayo holiday is often associated with parties and alcohol. 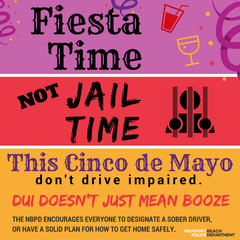 In the midst of the celebrations, it’s easy to forget the most important Cinco de Mayo plan of all: designating a sober driver. Too many people are lying to themselves about the dangers of impaired driving. Some think that they can play it by ear, and wait until they are heading home to decide whether or not they are “okay to drive”. But by then, it’s too late. Remember to designate a sober driver or make alternate transportation plans before you leave home. This weekend, law enforcement officers from police departments, the sheriff’s departments, and the CHP will be out in force, looking for the signs of impaired driving. On Friday and Saturday between 6:00 p.m. and 3:00 a.m., the Newport Beach Police Department will deploy officers on special DUI Saturation Patrols specifically for the purpose of identifying and stopping impaired drivers. Additionally, every NBPD traffic and patrol officer on duty will be on heightened alert to prevent a senseless tragedy due to alcohol or drugs. In recent years, California has seen a disturbing increase in drug-impaired driving crashes. The Newport Beach Police Department supports the new effort from the Office of Traffic Safety that aims to educate all drivers that “DUI Doesn’t Just Mean Booze”. Taking prescription drugs (particularly those with a warning on the label about driving or operating machinery) or using marijuana (especially in combination with alcohol or other drugs) and be incredibly impairing, and can result in a DUI. If you don’t designate a sober driver ahead of time, or have a solid plan for how you will get home safely, you are setting yourself up for disaster. When you drive while impaired, you run the risk of killing yourself or someone else. An impaired driver is also subject to many consequences: jail time, the loss of a driver license, higher insurance rates, and dozens of other unanticipated expenses ranging from attorney fees, court costs, car or motorcycle towing and repairs, and lost wages due to time off from work. Even if you don’t harm anyone, the average DUI costs about $10,000… which far exceeds the cost of a ride home. We would like to point out that the California Office of Traffic Safety offers a free mobile app – DDVIP – aimed at thanking the sober designated driver with perks and free offers at area bars and restaurants. App users can also easily request a ride home from Uber or Lyft. If you are planning to partake in the festivities for Cinco de Mayo, keep some numbers in mind. Throughout 2016, on average nationwide, someone was killed in a drunk-driving crash every 50 minutes. On Cinco de Mayo weekend, that equals 51 lives lost. Make the decision today that you will not get behind the wheel after drinking or when you are impaired by drugs. If you know someone who is about to drive buzzed or high, step in and help; take their keys and help them make arrangements to get home safely. A final statistic to remember: impaired-driving deaths are 100 percent preventable. Funding for this enforcement effort is provided to Your Police Department by a grant from the California Office of Traffic Safety, through the National Highway Traffic Safety Administration, reminding everyone to ‘Report Drunk Drivers – Call 9-1-1’.